Nestlé Malaysia is now tying up with the government authorities in Malaysia, especially the Ministry of Domestic Trade, Co-operatives and Consumerism to curb counterfeit products being sold in the local market. “The safety and quality of our products is a non-negotiable priority of Nestlé. Nestlé takes this issue very seriously as counterfeiting of products is an illegal activity that deliberately misleads the public,” said the brand on its Facebook page. It added that if consumers think they have purchased counterfeit Milo products they should contact the brand Consumer Service Centre. Food and beverage company Nestlé Malaysia is helping consumers identify counterfeits of its iconic Milo drink today, after a successful raid by Domestic Trade, Cooperatives and Consumerism Ministry in Negeri Sembilan. Malay daily Utusan Malaysia reported that the ministry has seized RM250,000 worth of counterfeit Milo products in Mantin, a wealthy neighborhood in Negeri Sembilan on March 13. Since then, Nestlé Malaysia has been working quickly to launch a campaign helping consumers identify the fake products and putting up statements on its social media assets. 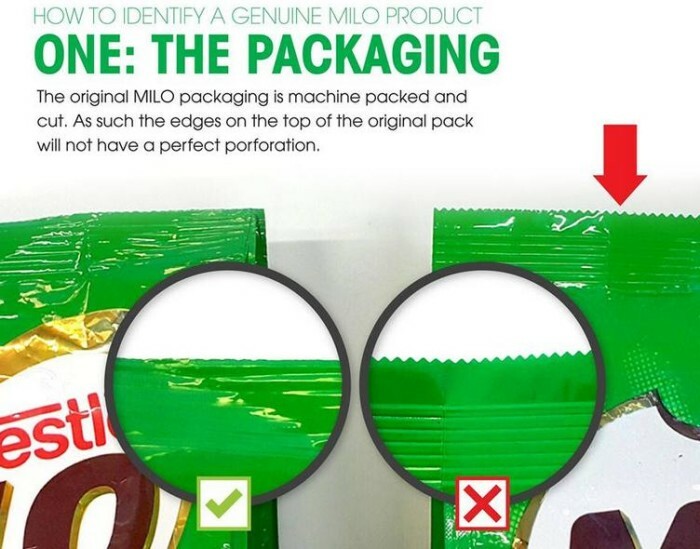 The company’s Facebook page shared a photo showing consumers how to distinguish counterfeit Milo packaging based on the perforation of its pack. It also urged customers to lodge reports with its customer service if they had unwittingly bought counterfeit versions of the chocolate malt drink. Meanwhile, responding to a consumer on its Facebook page, Nestle Singapore said Milo powder in refill packs sold in Singapore is manufactured at the Jurong factory in Singapore under stringent quality controls and are safe for consumption.It urged consumers to look out for the “manufactured in Singapore” label. According to Utusan Melayu, state chief enforcer Saifulbahri Abdul Kadir said that the counterfeit product was ready to be distributed around the state. Confirming the illegality of the production mill, he said that the case will be investigated since it went against the tight health and safety regulations accorded to Nestlé factories in Malaysia. One daughter, who was a marketing executive at the company, is currently under investigation for assault claims. ..
"Advertising has always stood at the intersection of business and creativity.".. Google Philippines confirmed that Narciso Reyes has left his post and the company is currently on the hunt for a successor. ..